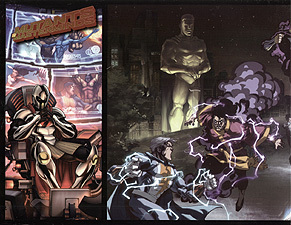 The Mutants & Masterminds Deluxe Gamemaster Screen is both sturdy and practical and looks great on the game table. 10.99 All the charts and tables you need to run the World's Greatest Superhero RPG are displayed on durable hardback stock, with a panoramic action illustration of the Freedom League on the front? It includes a handy Toughness Save Matrix, for instantly determining damage in the heat of combat. The screen also includes a second edition update of the classic Time of Crisis adventure by long-time M&M author Christopher McGlothlin, a great adventure to kick-off your own Mutants & Masterminds series. Omega, the evil overlord of the Terminus, has begun a scheme to destroy not just the universe, but every universe, and destiny has chosen your heroes as the only ones who can stop him!